Wednesday Jan. 28: Seth Lee and I are starting a monthly 4th Wednesday engagement at Chaz at the Raphael hotel on the Plaza, Wornall and Ward Parkway, 6-10 p.m. We’ve been playing there for several years, and we’re currently booked 1/28, 2/25, 3/25, 4/22 … Great venue! Thursday Jan. 29: Seth and I are back at it at the Broadway Jazz Club, 36th and Broadway, 7-10 p.m.
Wednesday Feb. 4: Matt Otto and I will play the Broadway Club, 7-10 p.m.
Thursday Feb. 5: Seth and myself will play at the elegant American Restaurant at Crown Center from 6-9 p.m. It’ll only be slightly less elegant with the two of us there! 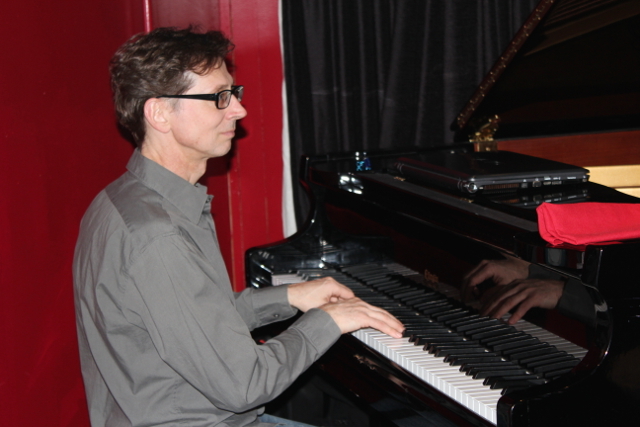 Thursday Feb. 26: I’ll be trying to keep up with the fabulous vibraphonist Peter Schlamb at the Broadway Jazz Club, 7-10 p.m.
Trio with Seth Lee and Sam Wisman, Tuesday, Feb. 25, and Tuesday, March 25. We’ve worked up some pretty cool arrangements over the last 10 years! duos with Seth Lee Friday, Feb. 27, and Thursday, March 20. Seth and I are also playing at Chaz for Sunday brunch, 10 a.m. to 1 p.m. March 30. I really enjoy the duos with Seth in this relaxed, intimate atmosphere! Bob Bowman and I are taking this Monday (Feb. 24) off to go to Everette DeVan’s benefit at the new Broadway Jazz Club, 3601 Broadway. But for the time being, we’re still playing Monday nights at the Green Lady Lounge from 10 p.m. to 1 a.m. It’s been a blast, and lots of good musicians have been showing up to play! Hey, all, here’s letting you know about some gigs I have as a leader just around the corner. Happily, I get to play with great players that I’ve been playing with for years in very nice settings. Would love to see you at some of these! 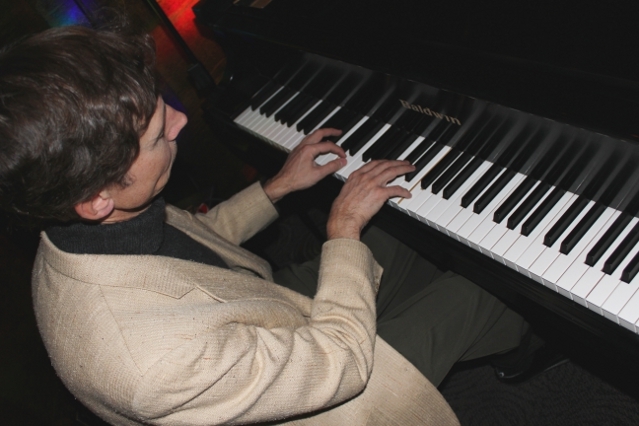 Sunday, Nov. 17 – Brunch at Chaz (in the Raphael Hotel, 325 Ward Parkway) with Seth Lee , 10 a.m. – 1 p.m.
Thursday, Nov. 21 – My Quintet (from the “Stretch” CD) plus special guests Lilah and Annabelle at the Green Lady Lounge, 1809 Grand Blvd., 8 – 11 p.m.
Sunday, Nov. 24 – Brunch at Chaz again; this time with Ben Leifer. The i’s have all been dotted and t’s crossed. 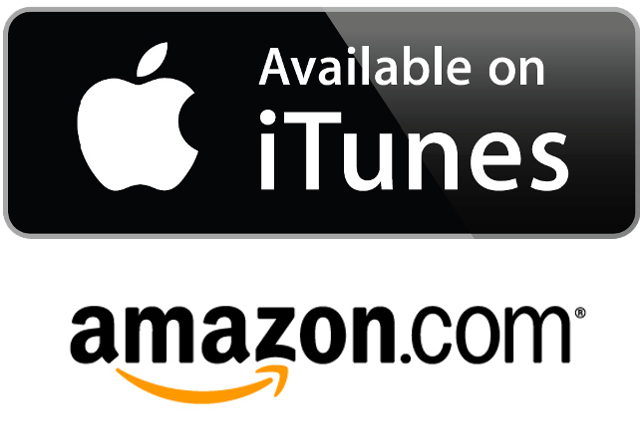 My new album, “Stretch,” is now available for your buying pleasure as a download on both iTunes and Amazon.com, as well as in Compact Disc (or MP3) form from CDBaby.com. 8/15 — I’m at Chaz at the Raphael Hotel with Kathleen Holeman. Much fun! 9/13 — I’m at the Take 5 Coffee + Bar, 151st & Nall, with Seth Lee + Sam Wisman. For those who ask me about trio gigs! 9/24 — My Quintet (from the Stretch CD) at JCCC’s noon free concert series. 11/21 — Same Quintet plus special guests Lilah and Annabelle @ the Green Lady Lounge, 8 – 11 p.m.
For more info about these and all my sideman gigs, just click on “Upcoming Gigs” on the top-line menu. 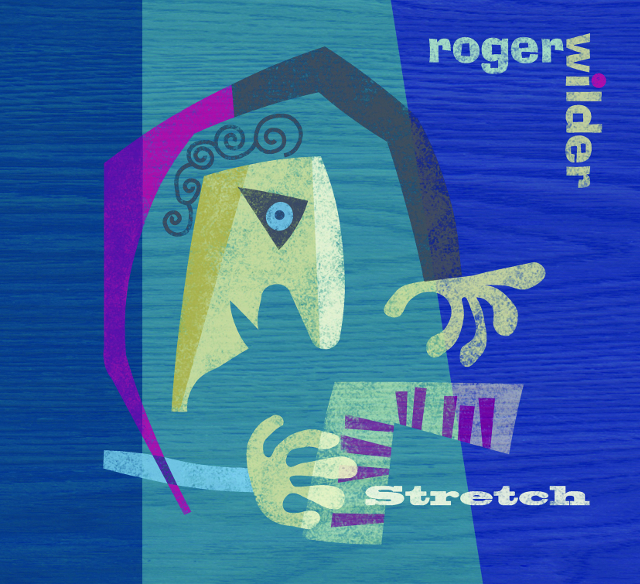 Several people have asked where they can find my new CD, “Stretch.” As of now, it’s only available from me directly or from www.cdbaby.com. You can download it there or purchase the physical CD. Or you can e-mail me at rogermwilder@sbcglobal.net. Or you can come to one of my gigs; I almost always have a copy with me – click on “upcoming gigs” above to see where. I’ll let you know when the CD is available on iTunes, Amazon, etc. ; I’m working on it! New CD is ready; Let’s party! It’s finally here! 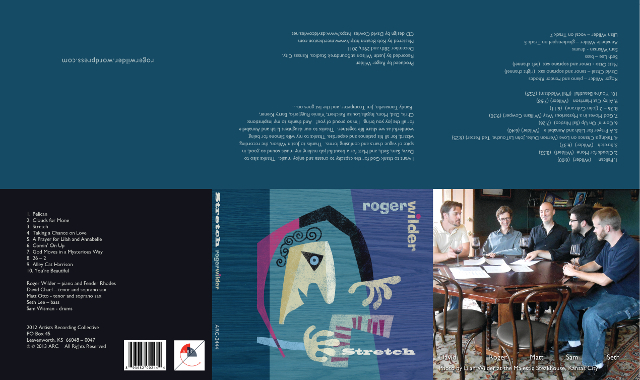 “Stretch,” my first CD as a leader, and I’m REALLY happy with everything, from the music to the artwork to the mastering. I will have a copies for sale at two CD-release parties scheduled for this weekend — Friday, April 19, at the Blue Room and Sunday, April 21, at Take 5 Coffee + Bar. The guys who helped me make the music on the disc will join me in these live performances: David Chael and Matt Otto, saxophone; Seth Lee, bass; and Sam Wisman, drums. Hope you can come on out and catch some of the tunes! Performing at the Cafe Trio. I played a really enjoyable gig with the new band Parallax last month at the Westport Coffee House. My favorite part was the really musical and high-energy interaction between the two drummers — yes, two drummers — Ryan Lee and Brian Steever. I’m looking forward to the next stop on the Parallax Coffee House Tour Thursday, Aug. 9, at the Take Five Coffee Bar, 151st and Nall in Leawood. About that CD, I’m still working on it at a snail’s pace and hope to have it out this fall. It’s all mixed and sounds really good. Five originals, a Coltrane tune, a Sal Nistico tune, a standard, a praise song and an old hymn.